Recent startups have more outlandish name and domain name combinations than ever before. These new businesses tend to reach for more imaginative types of names over the more descriptive names that were previously expected. Curious about naming and domain name trends, we set out to quantify trends of new venture funded startups and to reveal possible reasons for these trends. We conducted a study on 700 companies to determine possible naming and domain name trends. We also interviewed naming and branding thought leaders for insights into some of these trends and to uncover what makes a company name successful. From the study and expert interviews, we found that there is a clear movement towards creating more invented types of names and towards resourceful combinations of words for new company names. We also uncovered practical reasons for many of the trends that we came across. The need for domain name and trademark rights definitely plays a part in the types of names that are available. Additionally, more indefinable factors such as marketing and branding can influence the types of names that companies lean towards. To examine some of the recent naming trends, we collected data from 700 companies. The first group contained 350 companies from the 2015 Inc. 500 list; all of these companies were founded before 2012 and had a minimum of $2 million in revenue in 2014. 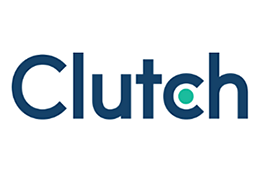 The second group contained 350 companies that were identified through the CrunchBase database; all of these companies are venture funded startups that were founded after 2012 and received a minimum of $3 million in venture funding in 2015. The data we collected for each company included: the name, the name type, the construction of the name, the domain name, the domain extension, and the industry the company resides in. We then compared the name types of companies founded before 2012 on the Inc. 500 list to the venture funded startups that were founded after 2012. We made this comparison to determine any naming trends among the recently founded startups. We used Zinzin’s naming criteria for our name type analysis. We analyzed whether a name was primarily descriptive, experiential, evocative, or invented. In our comparative study, we found that 75 percent of the companies founded prior to 2012 had primarily descriptive or experiential names. Only 17 percent had invented names and a mere 7 percent had evocative names. 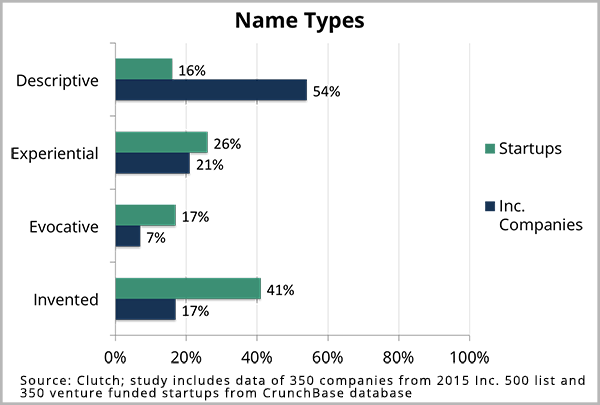 In contrast, of the startups founded after 2012, 41 percent had invented names and 17 percent had evocative names. The companies founded after 2012 have a much different spread of name types than the companies founded before 2012. While there are infinite reasons for a company to develop a certain type of name, there are two clear trends that elicit discussion. There is a clear attempt for startups to move away from descriptive types of names and towards more inventive types of names. Real words used for obscure meanings. These new companies tend to reach for more imaginative types of names over the more descriptive names that were previously expected. While some of these naming tendencies might be due to popular tendencies or industry trends, some are out of necessity. This necessity can stem from domain and trademark issues to marketing and branding survival attempts. Can the type of name influence the success of a name and of a brand? Tyler Doyle, the creative lead of the naming agency A Hundred Monkeys, illustrates that the success of a name really depends on the company being named. A successful company name is not indicative of the type of name but rather a myriad of factors that are dependent on the company itself. Jay Jurisich, the founder/CEO and co-creative director of the naming agency Zinzin, unveils the myth of a most successful type of name. If creating a successful invented name is so rare, why are recent startups flocking towards more invented names? While the success of a name varies and depends on numerous factors, there are still obvious naming trends. We unveil six possible reasons for recent naming trends and what each means for the future of company names. There is an advantage to having a more descriptive or real word name. Descriptive, real word names have meaning and point to a particular market and space where a company presides over the competition. A company can have a name that immediately positions them within an industry so that they are readily associated within that niche. Brannon Cashion, the global president of the branding agency Addison Whitney, explains the benefits and limitations of more descriptive names. Descriptive names can introduce a company directly into its competitive landscape but, if not named appropriately, this approach can go awry as a company grows and potentially expands out of their initial products or services. As new companies learn from the mistakes of older companies, they see the consequences of choosing a narrowly descriptive name in regards to future growth. The move away from more literal, descriptive names could be to avoid the possible limitations that a purely descriptive name holds. For example, Phil Davis, the president of the branding agency Tungsten, discusses Steve Jobs’ choice to go with the name Apple instead of a more descriptive name that would eventually become very limiting. By not naming a company on narrowly descriptive terms, companies have room to grow beyond their initial offerings. The trend away from descriptive names could be to avoid limiting names that hinder potential growth. While not a definitive reason, the flexibility of inventive names could guarantee more latitude later on. As every industry becomes more saturated, there is limited room for a new company to enter and directly stand out. This move away from more descriptive names and towards more invented and evocative types of names could stem from an attempt to find the available white space in an industry. When developed thoughtfully, these more creative and invented types of names could help to differentiate a company from the competition. Scott Milano, the owner and managing director of the naming and branding agency Tanj, gives an example of a naming initiative that disrupted the gaming industry. Another example addresses a past trend that incorporated founders’ names into the company name. Instead of using descriptive, literal names, some new companies are using real human names that have no real association, but carry more empathetic and metaphorical connotations. Margaret Wolfson, the founder of the naming agency River + Wolf, introduces a new company with a name that directly stands out within its industry. These are examples of more evocative names that stand out in saturated industries by building a story through unique name types. Not only do these distinctive names slip into the unused white space, they also elicit a story and bring more curiosity to a brand. New companies try to find ways to stand out among older competitors and many attempt to build their own, unique brand. More inventive names can help a company establish their brand apart from the connotations of real words and apart from typical industry specific names. An invented name gives a company a clean slate to inject their own meaning and brand story into a word. Purely invented names have no associated meaning built into them. These names are unidentifiable at first and a new company needs to educate people on the meaning of a new invented name. There is room for a brand to stand out from the established competition with an evocative name or with an invented name that allows them to build new meaning. As various industries populate and more companies attempt to break from the crowd, these invented names could seem like a good opportunity to build a new brand. The way that brands communicate is constantly changing. The rise of different social media channels and new media outlets could have an influence on the use of more outlandish names. A name that captures attention and makes people ponder the story of a name can help a company stand out in its industry. Building a strong brand story from a company’s name can help with the long-term marketing of a brand. The trend to deviate from more descriptive names and towards invented or evocative names can have several intentions related to branding and marketing. As new companies attempt to enter an industry with new and fresh ideas, many see that more creative types of names look like a good opportunity to immediately stand out. When done successfully, an evocative and/or invented type of name can have extensive benefits. Many reasons for these recent trends could also be attributed to the legal benefits of creating a new or oddly constructed name. Trademark and domain name limitations are possibly a direct reason for the surge in names that are invented or have odd combinations of various words. Kristen Pembroke, the director of client services at the branding agency Catchword, reveals that many recent trends are attributed to these limitations. There are increasingly less real word names and less real word combination names that are available from both a trademark and domain name perspective. However, there are different ways that recent companies attempt to elude trademark and domain obstacles. Many of the solutions include obscure combinations of real words, blending parts of words to create a new word, using a foreign word that is not widely known by English speakers, or purely inventing a new word. The use of foreign words for a company name is another tactic that some companies embrace for trademark purposes. A common naming trend that attempts to circumvent trademark issues but keep some real word recognition is to use slightly invented names that offer suggestive and memorable elements of real words. Many of the incentives and trends associated with securing a name trademark also apply to securing a domain name. However, there are further solutions for getting around domain name issues. There are new top-level domains that continually arise and give more leeway for new company names. However, 88 percent of the startups have a dot-com domain extension, demonstrating that a dot-com URL is still incredibly important for many companies. A dot-com domain name has always been the staple of a legitimate, successful company online. 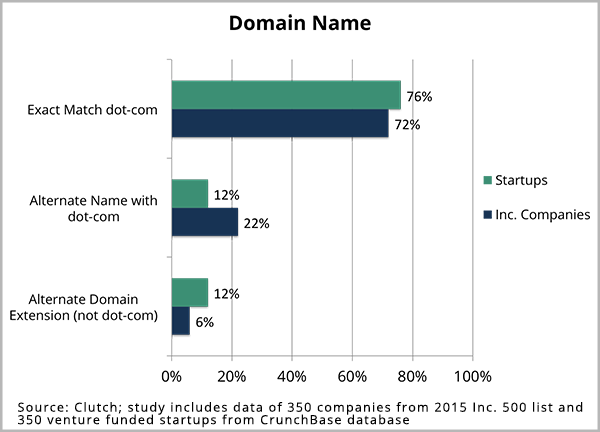 The fact that 76 percent of the startups have an exact match dot-com domain name shows how important the exact company name with a dot-com extension still is. However, securing a domain name that is not already taken is an immense obstacle for many companies that desire a dot-com domain. A direct example of valuing dot-com domains is from the naming agency Tungsten that collects domain names in hopes that they can guarantee a dot-com domain for their clients. For those that haven’t been seeking out viable dot-com names, there are various tactics to create a name that has a matching dot-com domain extension. Since most real word dot-com domain names have already been acquired and are either very pricey or not available, these strategies of creating new names are widely used. Beyond an exact match there are other options to secure a dot-com domain. One option is to use the company name along with a relevant descriptor word. Another domain name trend is to add an action word or an inviting word before the brand name. For example, many companies that target consumers will add ‘join’ or ‘get’ before their brand name for their domain. It is increasingly more common to add action words or invitation words like welcome or hi before the company name as a tactic to acquire the domain as well. While recent naming trends could stem from the need for a matching dot-com domain, there are other alternative domain options that are rising in popularity. These alternatives could influence future domain trends. Recently, there has been a rise of alternative gTLDs (Top Level Domains) and many have assumed that startups would gravitate towards some of these alternate domain extensions. The number of startups with an alternate domain extension (12 percent) is double the number of companies founded prior to 2012 (6 percent). However, the data shows the looming prevalence of the dot-com domain name. Many naming experts believe that the company name should take preference over the need for a dot-com domain extension. Thus, many of the experts believe that alternate domain extensions can be a useful resource for many companies that have a quality name and that can’t acquire a dot-com extension. Many of the naming experts believe that a quality, well-positioned name has greater importance over acquiring the dot-com exact match for the name. In many cases having the alternate domain extensions can also help position a company in the right space. Whether it be an industry specific extension, a relevant country code extension, or even an extension that acts as a portion of the company name, these alternative extensions could benefit a company more than a dot-com extension. These new top-level domains can also be helpful for Search Engine Optimization (SEO), allowing companies to include a relevant keyword as a part of their domain name like dot-bank or dot-tv. Furthermore, the latest option is for a brand to acquire its own brand name as a domain extension. This relatively new opportunity allows companies to create brand specific top-level domains. These domains can be bought for a hefty price tag but can result in unique and powerful branding opportunities. When asked about the future for branded domains, Bill Hartzer, the senior strategist at Globe Runner, commented on the possible changes ahead. While many still dwell on the power of the dot-com, others recognize possible breaks from the familiar. Even large, reputable enterprises are departing with their well-known dot-com domain for better branding, security, and customer experience opportunities. Even though a specific branded domain might not be realistic for smaller companies or startups, it might influence a movement towards acceptance for a diverse range of top-level domains. With various options available for viable domain extensions, a domain should never be a reason for holding back on a desired name. While there are still trademark limitations, a name should represent a company and its brand positioning the best it can. While a company should consider the marketing, branding, trademark, and domain implications when choosing a company name, the right name still depends entirely on the company and their intended brand positioning. Many of the thought leaders in the naming industry contended that, while these trends are apparent and informative, they are still solely trends. A trend does not necessarily mean that a certain name type will be the most successful, and a trend should not determine how a company is named. Naming a company is immensely difficult and there is a continual need to rise above the trends to find the best name for a specific company. A reliable naming company rises above trends and uses their creative abilities to come up with successful names. Naming a company is one of the most important steps in building a brand and is reason to consider hiring a professional naming company. For more information on the process of developing a name, take a look at the full naming expert interviews.